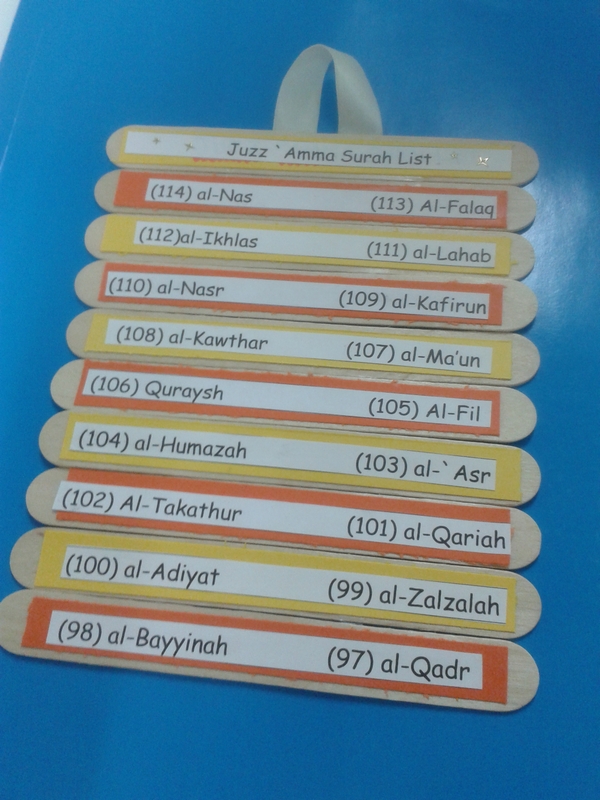 One fun way of teaching the Surah order of Juzz `Amma is to create this Accordion folding stick craft activity – what a mouthful! 🙂 I came across this activity as a Butterfly activity and it has many versions such as the Father’s Day one. Here is the link to the Bible craft version on Danielle’s Place of Crafts and Activities as it has excellent pictures that explain how to make it. There are two ways of making this activity: If you want to hang it, you can attach a ribbon to the top into a loophole or leave the ribbon and use it to tie it together. Also, the Surah order can be either from Surah Naba to Surah al-Nas or the other way around. 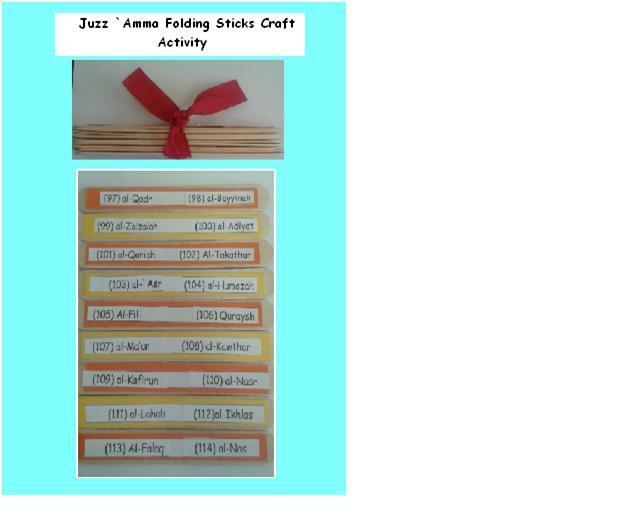 Jumbo Craft sticks: For my class I needed 10 for each student so I had to buy them in bulk from Amazon. For copyright reasons, I don’t think I can include even the instructions – so If you want to make this Accordion folding please head over to the Danielle’s place of Craft and Activities site. For my class: I have cut the card into strips that fit into the jumbo size I need. If you want to avoid cutting strips because it is a time consuming thing, you can buy colored jumbo lollipop sticks. I have added stickers to jazz it up as well! Hope you enjoy creating this activity with your class! 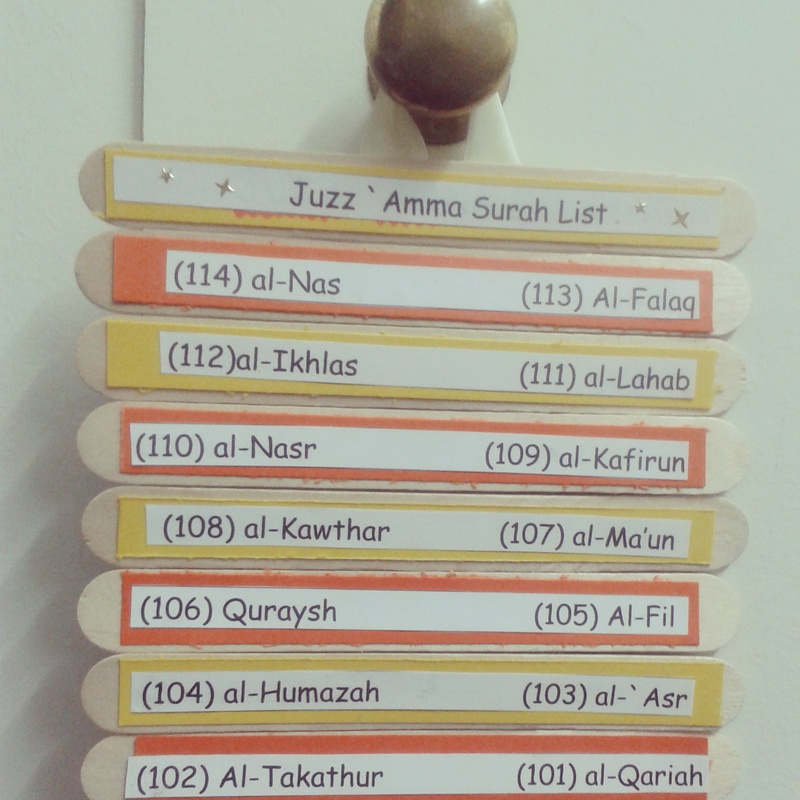 This entry was posted in Juzz Amma Craft Activity and tagged Accordion, activity, arabic, class, class game, classroom, craft, craft activity, fun, Juz Amma resources, Juzz Amma craft activity, quran, Quran curriculum, quran syllabus, review, revision, Surah, Surahs, Surahs. Juz Amma. Bookmark the permalink.